The pipeline of rare disease drugs in development at Ionis Pharmaceuticals has grown significantly in the last five years. And, with a robust pipeline combined with a commercialization strategy, including complex partnerships involving complicated deal structures, financial leadership roles are key to managing the process and bringing life-changing therapies to market. When Ionis needs to fill critical leadership roles, The Chase Group delivers outstanding people who are committed to the mission and the culture. Numbers don’t lie, and no one knows that better than Beth Hougen. As Chief Financial Officer of Ionis Pharmaceuticals, it’s her job to account for the numbers – every dollar of revenue, expense, investment and profit at the publicly-held RNA-targeted drug discovery and development company. And the numbers at Ionis are compelling, especially the ones related to its newly expanded and extended strategic collaboration with biopharmaceutical giant, Biogen. In what is being touted as one of the largest research stage collaborations in industry history, Biogen is investing $1 billion in cash and equity in the partnership, plus potential milestone payments, license fees and royalties. The alliance has already developed SPINRAZA®, one of the most successful rare disease drugs in history. Additionally, six more antisense drugs have advanced into development and more than 20 additional programs are in late-stage research. Along with this commercial and financial opportunity comes the need for seasoned financial executive expertise. Hougen has conducted a number of successful executive searches with The Chase Group in recent years as the need for financial analyses, oversight, and public-entity reporting requirements have expanded at Ionis and its publicly-held subsidiary. was introduced to the Chase team, and their methodology quickly won her over. Perhaps one of the best indicators of success in recruiting is the tenure of placed executives. 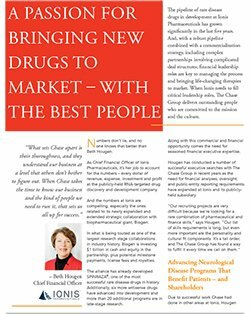 More than five years later, the first executive placed by Chase within Hougen’s team is still at Ionis today and doing very well. The demands for top finance talent are only increasing at Ionis. Ionis has an extensive pipeline and a commercialization strategy, which relies in part on complex partnerships with complicated deal structures. “Our strategy and our status as a public company means we need finance executives who can handle growth, keep pace with change and have experience in publicly traded companies,” says Hougen. The most recent addition to Hougen’s team, a vice president of finance, is a newly created role that evolved throughout the search process, and the Chase team delivered as promised. Ionis Pharmaceuticals has developed a successful partnership commercialization strategy that requires financial expertise and fluency at the senior levels of the finance department to execute, monitor, and manage. 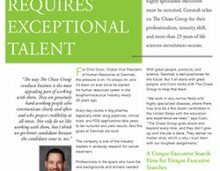 With plans to rapidly accelerate program growth in the coming years, Ionis is working with The Chase Group and other executives who not only have the right professional experience, but also the right personality for the mission and culture of Ionis. 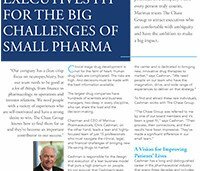 Over the last five years, The Chase Group has helped Ionis hire four new senior executives, on the finance team alone, who are ensuring that new Ionis drug programs have the strategic capital investment they need to create patient and shareholder value. Hougen says one of the main reasons she likes working with The Chase Group is their meticulousness. 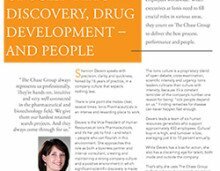 The Chase Group works with biotechnology, pharmaceutical and life science companies worldwide to help them find the best talent for their executive teams. Learn more at www.chasegroup.com or call Karen Leathers, President, at (913) 663-3100.